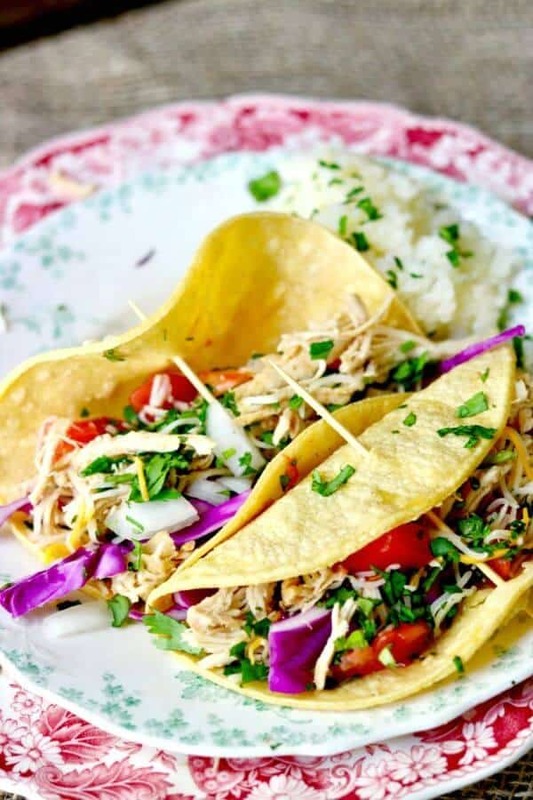 Slow cooker tequila lime chicken tacos are an easy Tex-Mex dinner that cooks right in your crock pot all day long. The flavors absorb into the meat during the long cooking process so that when you’re ready to eat you’ve got delicious chicken that just melts in your mouth. Perfect weeknight recipe anytime of the year! This is one of my favorite recipes and one that I’ve included in my Mexican Slow Cooker Cookbook. It’s so unbelievably easy that it will quickly become one of your family favorites. 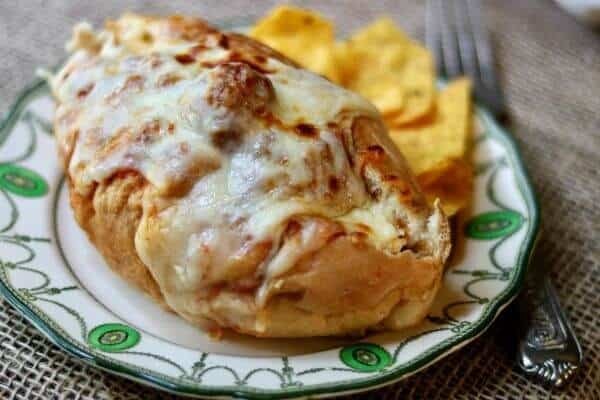 There’s almost no preparation time – you toss all of the tequila lime chicken ingredients in the slow cooker and turn it on then do whatever you have on your to-do list for the day. When you open the door and walk back in the house you’ll be met with one of the most amazing aromas you’ve ever experienced. Seriously – they should make a candle. 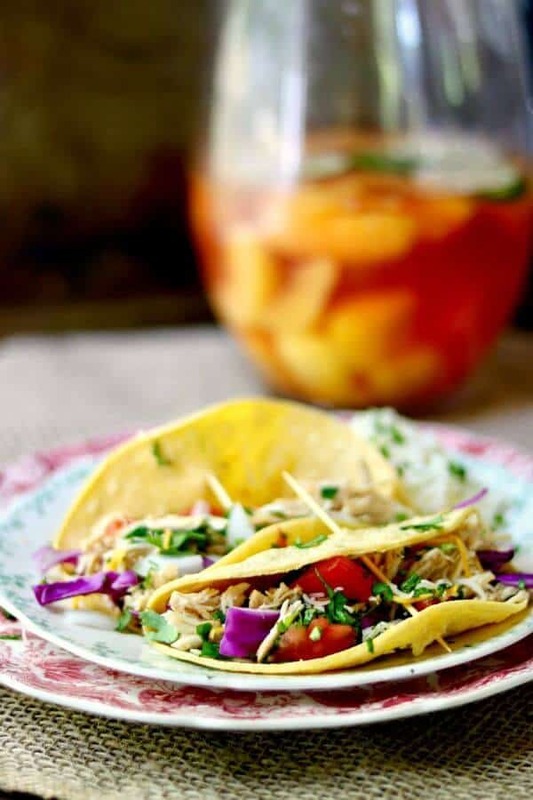 I’ve included instructions for preparing the taco fixings the night before so that when it’s time for dinner you only have to put it all on the table and go ahead and eat. I like to just put all of the toppings in small bowls and let people build their own tacos – it just doesn’t get easier. I just drop the dried ancho in the slow cooker and let it simmer along with the chicken. If you like things a little spicier just add another dried ancho or use a dried chipotle. You don’t have to take it out and discard it before you shred the chicken – it will be soft and you can shred it right along with the meat if you want to. This is a super easy menu for a weeknight supper that looks like you slaved away! Make the cake 2 days before you’re ready to serve and let it sit in the fridge. The sangria goes together the night before. When you get home you can put the rice in the rice cooker (omg if you don’t have one GET one – such a time saver!) and warm the beans up. Refried Beans from Don’t Waste the Crumbs are made in a slow cooker – super easy if you have 2 slow cookers or make them ahead of time and warm up when you need them! I love my slow cooker – I’ve had it for several years and it makes my life SO much easier. But… when I get a new one I’m getting this one that can be programmed with my smart phone! Chiles are available in almost every grocery store where I live but if you can’t find them Amazon has dried ancho chiles. 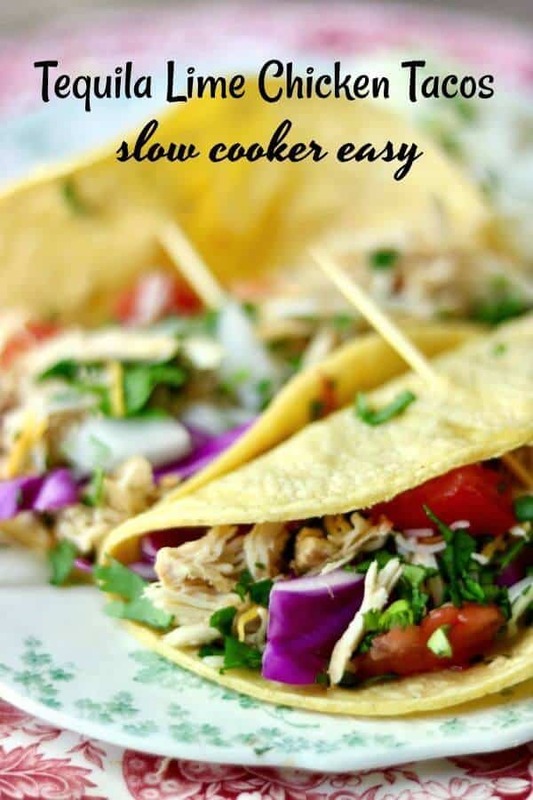 If you love Mexican food but you’re pressed for time you are going to love my Mexican Slow Cooker cookbook! Published by Rockridge Press in 2015 – 145 reviews averaging 4 1/2 stars out of 5. I love these and I think you will, too. You can also double the recipe and freeze it in meal sized portions. 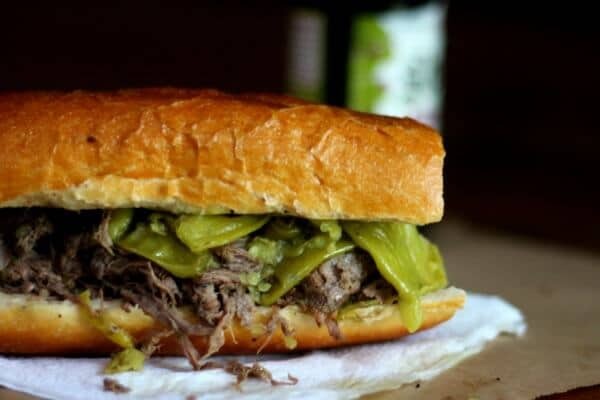 If your family is in more of a sandwich mood try these slow cooked Texas style cheesesteak sandwiches! Boneless chicken slow cooks all day absorbing the flavors of the cooking liquid. When you're ready to eat the meat is falling apart tender and ready to be added to your favorite tortilla. If you prefer not to use tequila then pineapple juice will work just fine. 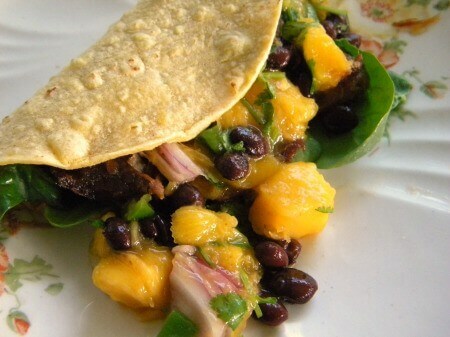 Serve this dish with rice, refried beans, and a tangy frozen margarita or pitcher of fruity sangria. Peel and chop onion. Add to airtight storage container and refrigerate. Dice tomatoes and store in an airtight container in the refrigerator. Cut limes in wedges and seal in an airtight container - refrigerate. Pit, peel, and dice avocado. Toss in lime juice and store in an airtight container in the refrigerator. Chop cilantro fine. Add to a storage container and refrigerate. Shred cabbage. Store in an airtight container in the refrigerator. Combine all of the tequila lime chicken ingredients in your slow cooker. Remove the ancho chile and discard. Shred the chicken and return to the slow cooker for 15 minutes. Warm the tortillas in a damp towel in the microwave. Add some of the shredded chicken. Top with your prepared toppings and squeeze a little lime over it just before eating. *Nutrition information is for the Tequila Lime Chicken only and not the tortillas or toppings. 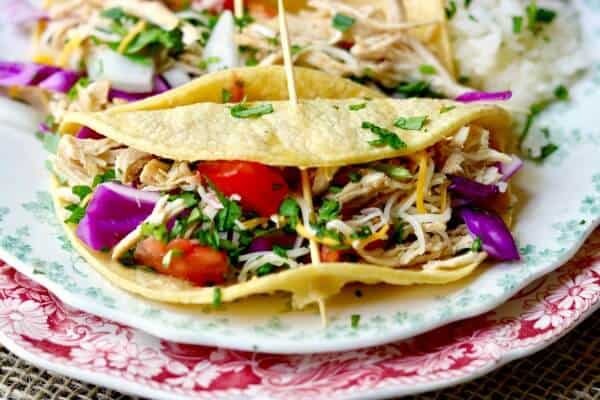 Love these slow cooker tequila lime chicken tacos? How about these easy recipes! This recipe is part of Meal Plan Monday#80. Check out all the awesome recipes. I made this yesterday and we all loved it! Glad i doubled the recipe – there was plenty to send home with my kids. I did add salt and a pinch of sugar as well as two tablespoons of tomato paste. This paired with a sweet slaw and the rest of the taco bar ingredients is the bomb. SO glad you liked it, Frannie!